This statue features the Madonna and Child Jesus in a unique and beautiful way. 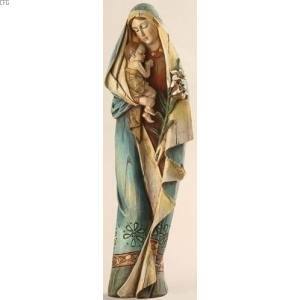 The cloak surrounding the Virgin Mary has beautiful decorative images on it, creating a realistic, even ethnic, feeling. Mary also holds lilies, a symbol of the purity both she and the Child Jesus possess. This statue measures 12.5".